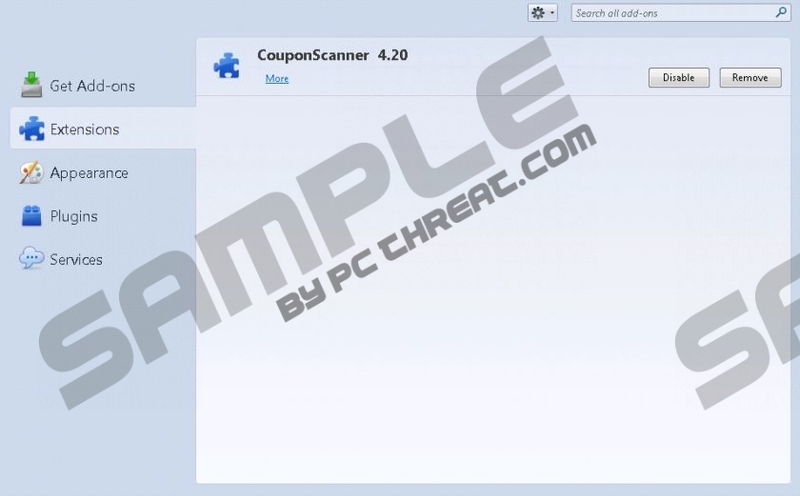 CouponScanner is a disturbing computer application, even though it may not seem like it when it first enters the operating system. There is no official installer of this application on the web; however, it can be installed onto the browsers despite this. Even though the add-on may be installed using different drive-by download scams, it is mostly distributed by third-party installers, like Installrex or Amonetize, which is very unfortunate. If this is how the program was infiltrated, it is presumable that you need to remove CouponScanner and delete other disruptive, maybe dangerous applications. Software bundling is a common technique used by many companies, including the ones we all trust and respect. Unfortunately, this trust may be used against you by malicious parties, particularly untrusted third-party software distributors. Packaged installers can be used to infiltrate CouponScanner and tens of clones from the same family, including ShopperMaster, GoSave, LuckyCoupon, etc. Please delete these advertisement-supported programs if they are running on the PC. Do you know what an advertisement-supported program is? We delete CouponScanner as adware as well. The term refers to a program that gains profit by presenting third-party advertisements. Unfortunately, not all adware and affiliated advertisers are trustworthy. In fact, chances of clicking on ads represented by schemers are very high if CouponScanner is responsible for them. If you do not delete the disturbing program, it will enable the connection to suspicious advertising domains which may be created or used by completely unreliable companies, malware distributors and parties looking to disclose your private information. Can you blame CouponScanner distributors for virtual security risks and backdoors linked to the displayed ads? You certainly should blame any program that allows suspicious, risky and dangerous activity. Nonetheless, you must realize that the real threats come from the parties affiliated to adware. Keep in mind that CouponScanner removal may solve only part of the problem, as other advertisement-supported programs may be running alongside. Keep in mind that your operating system will remain unsafe if you do not delete adware or other running infections. You have to be careful with CouponScanner removal. The program is composed of files some of which may remain active even if you think that the program has been deleted successfully. Have you chosen to follow the manual removal guides below? This is not the only step you will need to make. Do not forget to delete CouponScanner files and associated infections. Are these tasks too complicated for you? Do not worry and install automatic malware removal software ASAP. Click the Start button located on the left side of the Task Bar. Select Control Panel and then open the Add or Remove Programs menu. Remove the undesirable software (under Change or Remove Programs). Click the Windows/Start button on the Task Bar and select Control Panel. Select Uninstall a program and find the application you wish to delete. Right-click the undesirable program and then select Uninstall. Open the Control Panel and then choose the Uninstall a program utility. Right-click the program you want to delete from the system and select Uninstall. Quick & tested solution for CouponScanner removal.